An earlier article in Rail Engineer described HS2’s £2.75 billion procurement of at least 54 classic-compatible high-speed trains to run from London to Birmingham, Manchester, Liverpool and Glasgow. This month’s issue considers the very-high-speed (over 200km/hr) pedigree of the companies competing for this contract and where they might build their new trains. HS2 announced five selected bidders for its high-speed train contract in November 2017. These were Alstom Transport, Bombardier Transportation UK, Hitachi Rail Europe, Patentes Talgo and Siemens. In July, Bombardier and Hitachi announced that they would form a partnership to submit a joint bid for the contract. In response, HS2 invited Construcciones y Auxiliar de Ferrocarriles (CAF) to join the shortlist of bidders in the interest of maintaining robust competition. Bids are due to be submitted in May. Shinkansen Series 700 and Series 100. 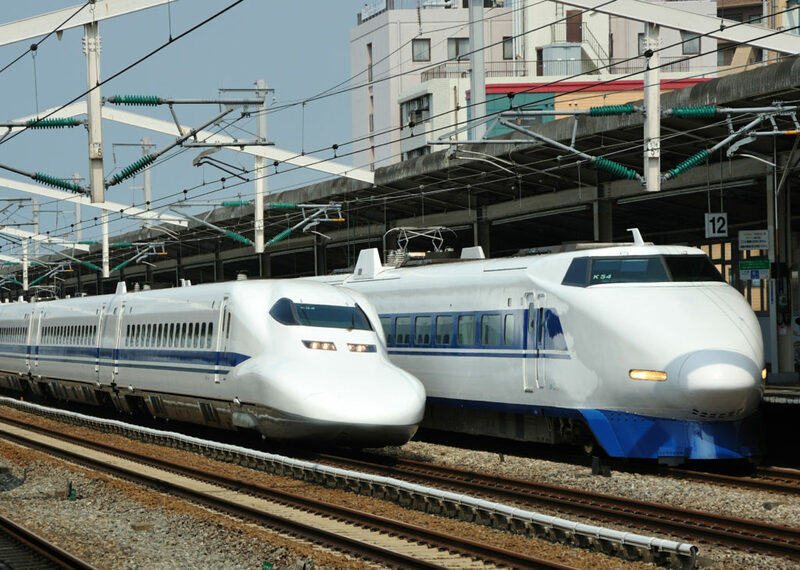 Hitachi’s high-speed train pedigree goes back to the introduction of the Japanese Shinkansen (shin – new, kan sen – trunk line) train service in 1964. Since then, the company has produced a further eleven types of Shinkansen train. Over this time, continuous improvement has reduced the weight of the train sets from 972 to 700 tonnes, increased their maximum speed from 210 to 320km/h and reduced power consumption such that the latest Shinkansen Series N700 at 300km/h requires only 68 per cent of the power of a Series 0 at 220km/h. Hitachi entered the UK rolling stock market with its 225km/h Class 395 Javelin train, which started HS1’s high-speed domestic services in 2009. This was developed from the Series 400 Shinkansen, modified to comply with EU standards. Since then, Hitachi won the Intercity Express electric and bi-mode trains for the Great Western and East Coast Main Lines and an order for the ScotRail class 385 EMUs. To build these trains, Hitachi Rail Europe built a 43,000 m2 assembly plant at Newton Aycliffe in County Durham. This started production in 2015 and can produce 35 vehicles a month. With the Newton Aycliffe plant operating at capacity, further train orders from Great Western, TransPennine Express and Hull Trains for class 802 bi-mode units had to be built at Hitachi’s Pistoia plant in Italy, which Hitachi acquired from AnsaldoBreda in 2015. 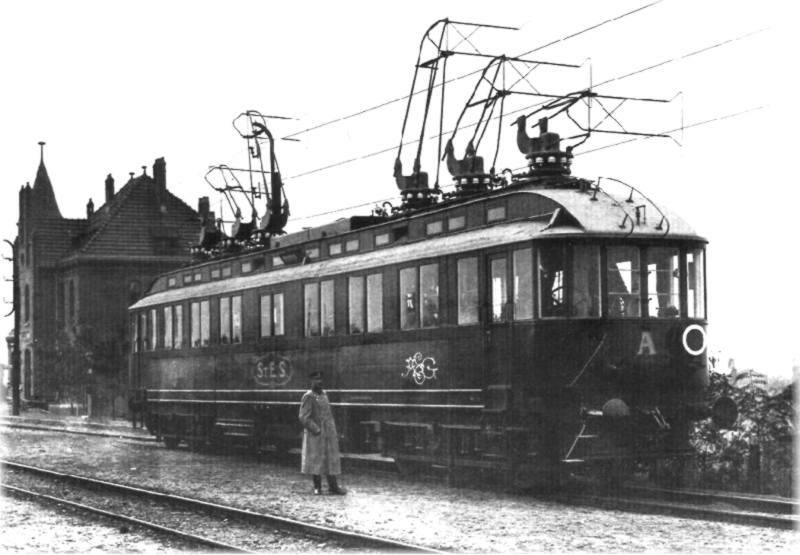 Experimental AEG three-phase railcar which set a world speed record for electric rail vehicles of 210.2km/h on 28 October 1903 between (Berlin-) Marienfelde and Zossen. AEG, one of the companies that eventually became Bombardier Transportation had a high-speed pedigree going back to 1903, when it supplied electrical equipment for a railcar, powered by a 10kV three-phase overhead line system, which achieved 210.2km/h, a rail speed record that stood for the next 51 years. In more recent times, Bombardier was part of a consortium with Siemens that developed the German ICE 3 high-speed train which entered service in 2002. Bombardier led the development of bogies, structures engineering, aerodynamics and pantographs. The ICE 4, which entered service in 2017, was also developed in partnership with Siemens. In a consortium with Talgo in 2005, Bombardier was entirely responsible for the development of traction and bogies for the power cars for the Talgo 350 train. In a partnership with Alstom, Bombardier built the USA’s only high-speed train, the tilting Acela, which entered service in 2000. It was China that provided a market for Bombardier’s wholly designed high-speed trains that were built by local train builders. The first was the 200km/hr CRH1A, which was based on its Swedish Regina trains. This was followed by the 250km/h CRH1B trains in 2009. In total 344 of these trainsets were delivered. 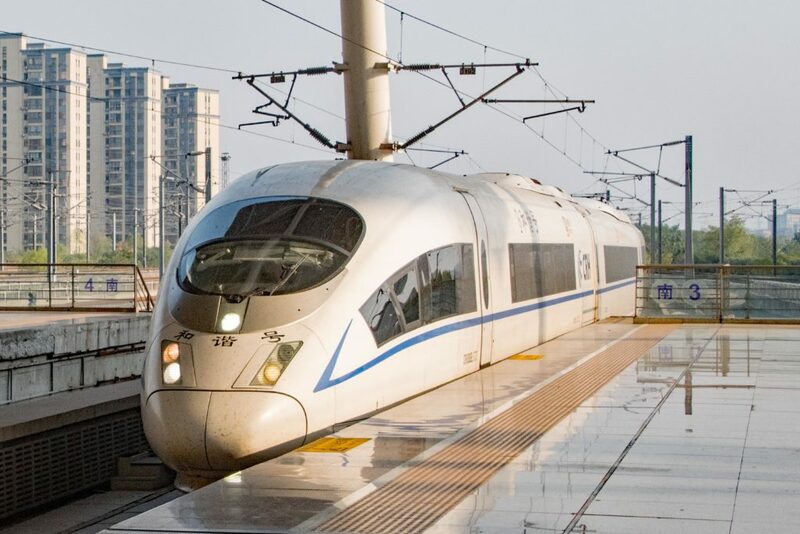 The first of Bombardier’s Zefiro high-speed trains entered service in China in 2009. These are 250km/h 16-car sleeper trains. The CRH380D is a 380km/h eight-car Zefiro variant for which China has placed an order for 85. These have achieved 420km/h during tests on the Chinese high-speed network. Hitachi and Bombardier’s Frecciarossa ETR1000. The Zefiro 300 variant is intended for European use and is designed for UIC gauge. 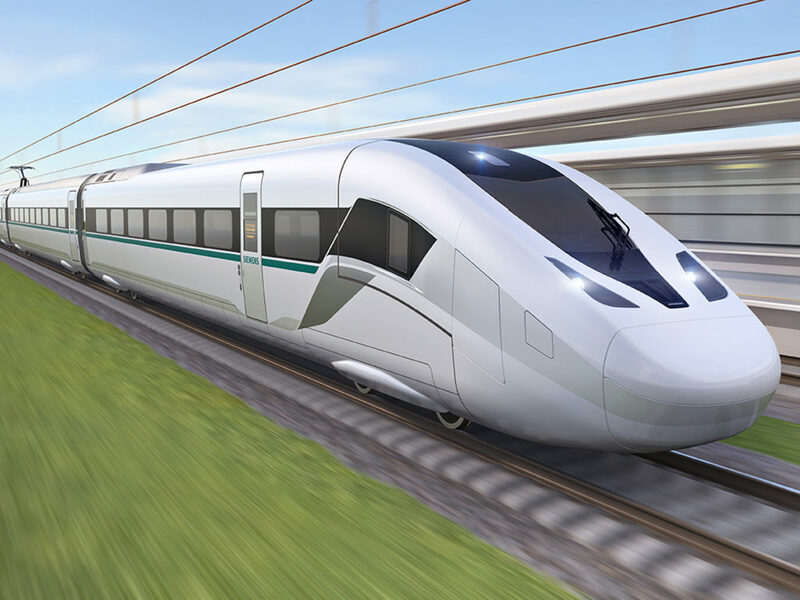 This design was offered by Bombardier in association with AnsaldoBreda (now Hitachi) for a bid that, in 2010, won the contract to build 50 Italian high-speed trains. With Bombardier supplying the bogies, traction equipment and control systems, Hitachi Rail Europe built the trains, including bodyshells, at its Pistoia plant. These eight-car ETR1000 trainsets, commonly known in Italy as Frecciarossa (the red arrow), entered service in 2015. 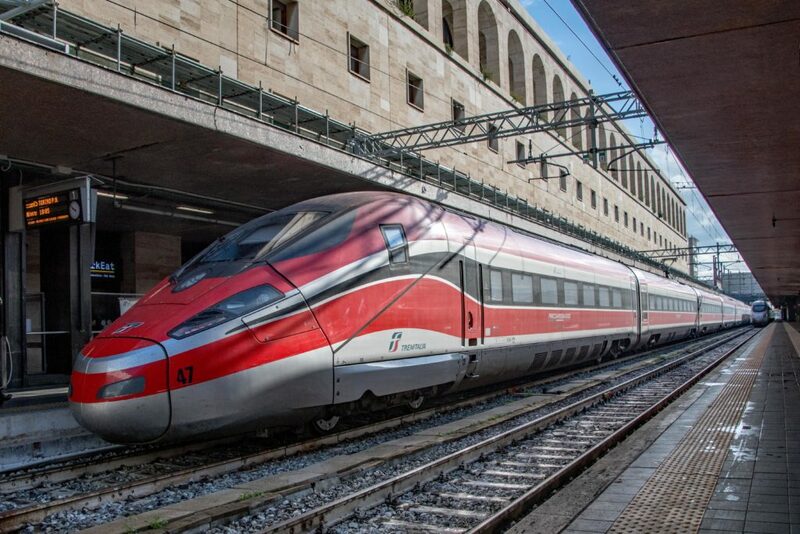 Rail Engineer was recently invited to travel on the Frecciarossa between Rome and Florence. This is Italy’s first high-speed rail route, which opened in 1977 and on which trains are limited to 250km/h due to its 3kV DC overhead line system. The remainder of the high-speed railway between Salerno and Turin is electrified at 25 kV AC and has a line speed of 300km/h. Frecciarossa services also serve stations on the conventional network. The train has four classes. Standard and Premium each have 2 + 2 seating. Business class has 2 +1 seating and Executive is 1+1. The train design allows for a flexible mix of seating arrangements. Such flexibility will be needed for HS2 trains as the seating will be specified by the train operator after the contract has been let. The Executive coach has just 10 seats and includes a six-seat meeting room. This was where Marco Sacchi, Hitachi Rail Italy’s head of high speed, answered questions. He advised that the train was designed for a maximum operating speed of 360km/h and had achieved 399km/h during testing. Although high-speed routes have better track quality than conventional routes, Marco is in no doubt that high-speed running presents significant challenges in respect of noise, vibration and ride quality. High speed also has other challenges in respect of passenger comfort, for example to avoid pressure pulses the train has a predictive system that closes the heating and ventilation system air intakes, within a tenth of a second, immediately before entering a tunnel. Although the Hitachi/Bombardier joint venture is focused on its HS2 bid, the two companies remain competitors in other markets. This requires special arrangements in respect of the bid team’s use of company-specific information. In the developing their bid and plans to build the HS2 trains, both companies will no doubt build on the partnership that built the Frecciarossa and use their manufacturing plants in Newton Aycliffe and Derby to best advantage. Pre-production Alstom TGV in 1979. France has a tradition of high-speed rail records dating back to 1955 when a 1.5kV DC SNCF Class CC7100 locomotive achieved a world record of 331km/h. This run demonstrated challenges of routine high-speed running after hunting bogie forces deformed 400 metres of track and destroyed the locomotive’s pantograph. This speed record lasted until 26 February 1981 when an Alstom-built TGV (Train à Grande Vitesse) achieved 380km/h on a slight down grade between Courcelles-Frémoy, Côte-d’Or, and Dyé, Yonne, on the LGV Sud-Est line. V150 train setting the world speed record of 574.8km/h near Le Chemin, France, on 3 April 2007. The current railway speed record of 574.8km/h was set on the newly completed but as yet unopened LGV Est line in 2007 by a specially prepared five-car train that was fitted with extra powered bogies, producing a total of 19.6MW from the enhanced 31kV overhead supply, and aerodynamic fairings that had been designed using a wind tunnel. The first two pre-production TGVs left Alstom’s Belfort plant in July 1978. These were subject to thousands of tests before problems of high-speed vibration and bogie stability were eventually resolved. Alstom delivered the first of 87 production TGVs in 1980. 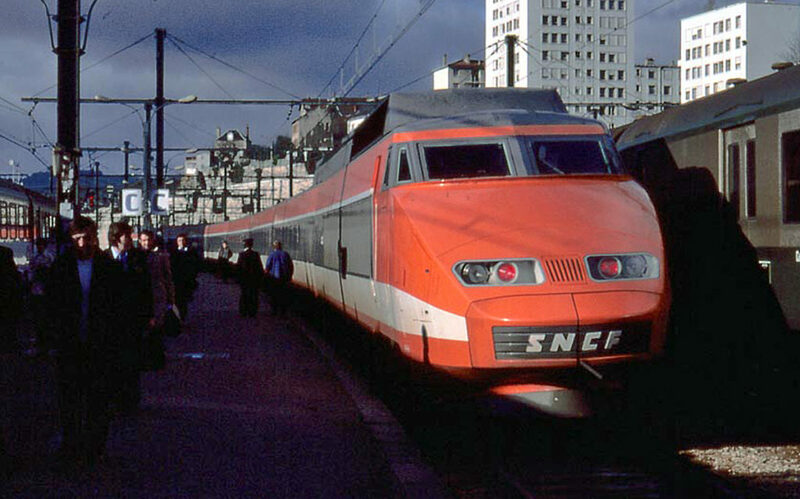 These originally had a maximum speed of 260km/h and, on 27 September 1981, were used to inaugurate Europe’s first high-speed rail service on the 409-kilometre French South East high-speed line. The French hi-speed network now consists of 12 lines totalling about 2,700 kilometres for which Alstom have delivered about 550 TGVs. These are articulated units of eight or ten cars that operate at speeds up to 320km/h. They include double-decker (Duplex) and postal service units as well as the first Eurostar trains. The TGVs have articulated passenger cars with a power car at each end which also powers the adjacent passenger car bogie. In 2000 Alstom took over Fiat Ferroviaria, whose tilting technology is used in Virgin’s Pendolino trains. The company has since used this technology on the Spanish Avant classes 104 and 114, both built in a consortium with CAF, the Italian ETR500/600, the Swedish RABe503 and the Russian-gauge Sm6 that operates between St Petersburg and Helsinki. Other overseas high-speed train orders included 94 CRH5A trainsets supplied under a technology transfer agreement to China. Another such agreement was for 46 18-car TGVs, of which 34 were built in Korea. Alstom also built 12 Duplex TGVs for Morocco. In 2000, Alstom unveiled its AGV design, which is unique in using articulated bogies for distributed traction. AGV-type bogies were fitted to the shortened TGV Duplex that achieved the 581km/h speed record in 2007. 25 AGVs were supplied to Italy in 2012. Alstom’s double decked Avelia high-speed train. As previously mentioned, a consortium of Alstom and Bombardier supplied the USA’s Acela trains. These will soon be replaced by a tilting variant of Alstom’s new high-speed train range, the Avelia, which is due to enter service on the Boston to Washington corridor in 2021. 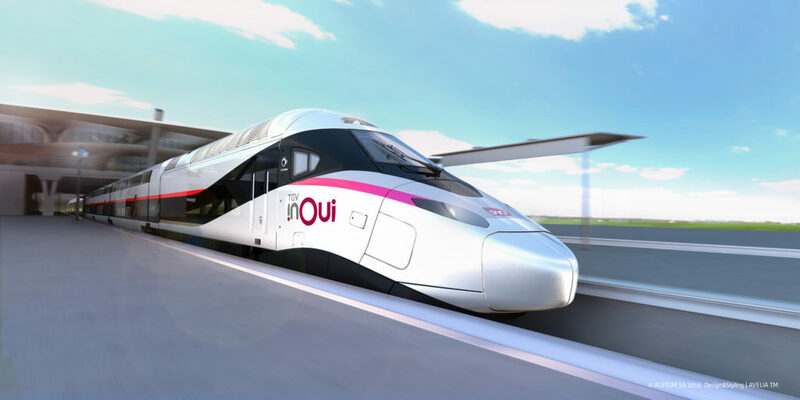 In one of Europe’s largest-ever high-speed train contracts, SNCF has ordered 100 double-decker Avelia trains. Should Alstom win the HS2 contract, it seems likely that its trains would be constructed at its 13,000 square metre Widnes facility in Cheshire, which opened in 2017. This is claimed to be the “biggest and most sophisticated centre for train modernisation ever in the UK”. It has three 260-metre roads and includes the traction equipment facility transferred from the company’s recently closed Preston plant. Alstom has signed an agreement for technical training at Widnes to be led by the National College for High Speed Rail (NCHSR), to whom Alstom also donated Eurostar power cars and an AGV passenger car for training. Germany’s high-speed service started in 1991 using 280km/h ICE 1, trainsets for which Siemens supplied the electrical equipment. The ICE 2, which entered service four years later, was built by a consortium of Siemens and Adtranz – acquired by Bombardier in 2001. The next high-speed train involvement for Siemens was the supply of traction equipment for the 220km/h Portuguese Alfa Pendular tilting trains, which entered service in 1999. Siemens Velaro E (AVE Class 103). The German ICE 3 high-speed train was produced by a consortium of Bombardier and Siemens. This was licensed to run at 330km/h and reached 368km/h on trial runs. It has eight passenger cars with distributed traction and so has no power cars. This train was the basis for the Siemens Velaro family, the first of which, the Velaro E, was delivered to Spain in 2005 to run between Barcelona and Madrid at up to 310km/h. Velaro variants were then supplied to Spain, Russia and Turkey. In addition, hundreds have been built in China. The 16-car Velaro e320 operates Eurostar services. The Chinese Class CRH380B Velaro variant. Siemens has also produced the ICE-T, a 230km/h tilting EMU for use on German conventional lines, and the Railjet which operates in Austria and the Czech Railways. This is a 230km/h locomotive and seven-coach push-pull trainset. The company is currently producing seven and twelve-car ICE 4 trains for which it has sub-contracted Bombardier to optimise design aerodynamics and produce trailer bogies and bodyshells. An ICE 4 train can consist of between five and 14 cars, with a flexible arrangement of power and trailer cars. In June, Siemens unveiled its Velaro Novo concept of an 8MW train operating at speeds between 250 and 350km/h which, it claimed, would “set new standards for efficiency and sustainability, using 30 per cent less energy when running at 300km/h”. Its car bodies are designed as “empty tubes” for flexibility and to increase passenger space. In March 2018, Siemens leased land in Goole for a planned train factory with a footprint of up to 75,000 square metres, an investment of up to £200 million. The construction of this plant was assured in November when Siemens won a £1.5 billion contract to build new London Underground Piccadilly line trains. 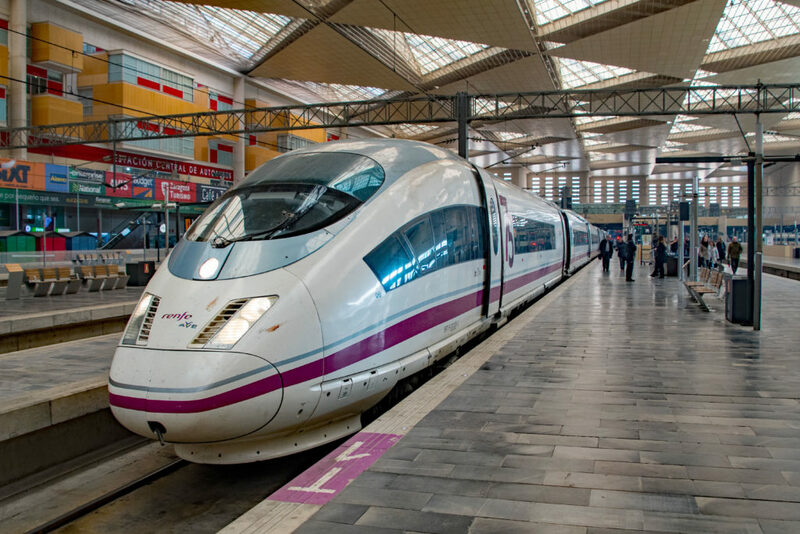 The Spanish high-speed rail network is more than 3,200 kilometres and was inaugurated with the opening of the 472-kilometre Madrid to Seville high-speed line in 1992. As this network is built to standard gauge, Spanish high-speed trains need to change gauge if they are to operate on conventional Spanish broad-gauge lines. This line required 24 AVE class 100 high-speed trains. These are an Alstom TGV Atlantique variant, with some being built by Spanish train builder CAF as its first experience of high-speed rolling stock. 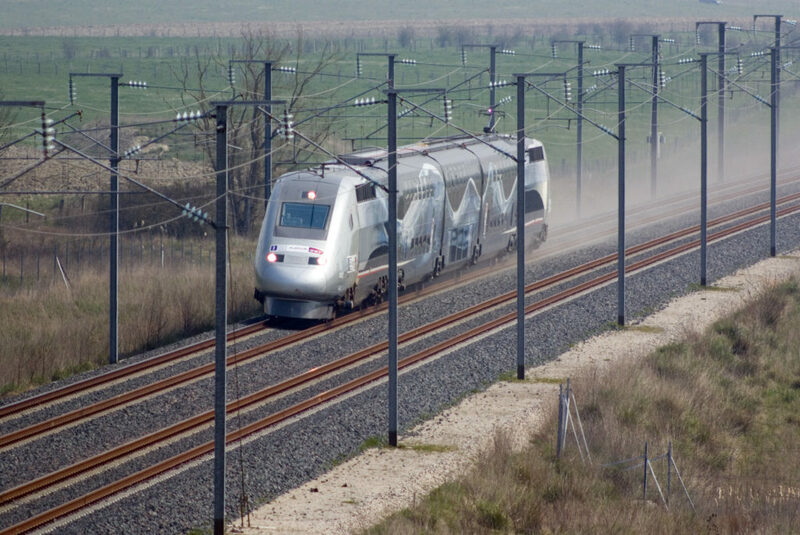 A CAF/Alstom consortium later delivered a further 89 Spanish high-speed trains. These were the Avant Class 104 (2004), Alvia Class 120 (2006), Alvia Class 121 (2008) and the Avant Class 114 (2011). The Class 120 and 121 trainsets have CAF’s SIBI active tilt system and BRAVA variable gauge bogies. CAF supplied twelve 250km/h Class 120 /121variant to Turkey in 2009 and, in 2010, unveiled its Oaris high-speed concept for 350km/h operation, which has distributed traction and a flexible interior layout. In 2015, CAF won a contract to supply eight four-car Oaris trainsets to operate on the Oslo airport rail link in Norway. CAF’s £30 million train production facility in Newport, South Wales, opened last year. This 15,000 square metre-plant is now fitting out Class 195 DMU bodyshells for Northern Rail and has started design and engineering work on the 77 DMUs that it is to build for the Wales and Borders franchise. Talgo has been progressively developing its unique trainsets since 1942. These feature short coaches, typically 13.5 metres long, between which are steerable two-wheel bogies without axles. Over the length of a conventional 26-metre bogie vehicle, this arrangement saves between five and ten tonnes as it has half the number of wheelsets. It also provides a low floor throughout the train. Furthermore, with less overhang, shorter coaches can have a wider bodyshell. The independent wheels also facilitate Talgo’s variable gauge running gear which is needed for Spanish high-speed classic compatible trains. Talgo’s suspension system provides natural tilt as the bogie’s main suspension spring assembly is well above the coach’s centre of gravity. This could give the company an advantage for HS2 services on curved routes to Scotland. 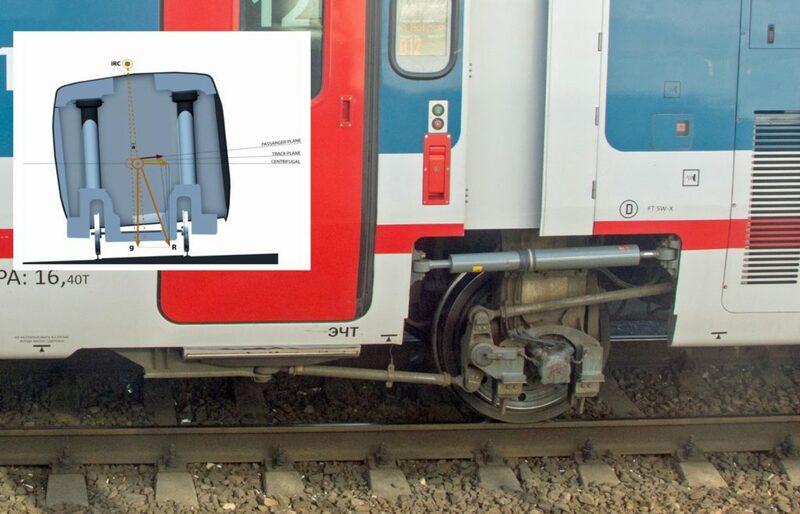 Talgo’s two-wheeled articulated bogie, inset shows how its suspension system provides natural tilt. Talgo’s first high-speed trainset entered service in 2005. This was the 300km/h Spanish Class 102, for which power cars were provided by Bombardier, of which sixteen were built. The Talgo/Bombardier collaboration delivered a further 72 Spanish trainsets, These were the Class 130 (2007), Class 112 (2010) and Class 730 (2012). In addition, North America and Russia each have seven Talgo trainsets. Since 2016, Russia has been using these to operate the Moscow to Berlin service, for which a variable gauge is required. Uzbekistan took delivery of two Russian-gauge 250km/h Talgo trains in 2011. 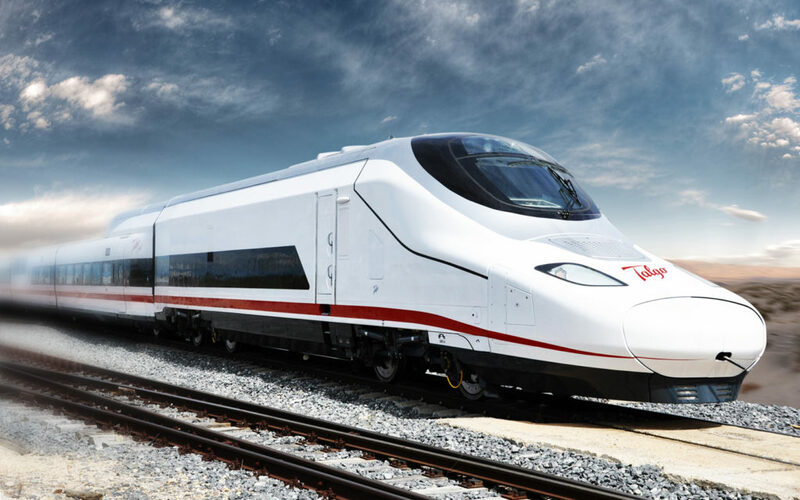 In 2017, Saudi Arabia inaugurated its high-speed service with 35 Talgo 350 trains running at 300km/h, for which Bombardier supplied the power car bogies, propulsion and control equipment. Talgo unveiled its Avril concept for an advanced 380km/h train in 2010 and now has orders for 30 of these trains for Spain. Although Talgo trains normally have low floors, an Avril variant offers step-free access from HS2’s 1115mm platforms. In November Talgo announced that its preferred location for building HS2 trains is the disused power station at Longannet in Scotland. This would be a 70,000 square metre plant employing at least a thousand people. An Innovation Centre would also be developed at Chesterfield. A Talgo statement advised that the company aims for “true UK manufacturing”, instead of assembling a kit of parts from overseas. Each bidder will probably be spending around £10 million on this bid, which only one of them can win. Yet HS2’s future passengers will certainly be the winners from its train procurement. The Frecciarossa, Avelia, Velaro Novo, Oaris and Avril are all exceptional trains, evolved from hard won experience and a wealth of expertise. Interestingly, much of this is the result of the current bidders working together on various high-speed train projects. The bidders all state that their trains will meet the HS2 tender requirements of energy-efficiency, ease of maintenance and flexible state-of-the-art passenger accommodation. By 2020, the HS2 procurement process will have quantified all these claims to establish which train offers the lowest whole-life cost to determine who will build these trains. Until then, readers may judge for themselves which one is most likely to win the HS2 bid. The construction of high-speed railways in Japan, France, Germany and Spain has also given a boost to their respective train builders, who are now competing to build HS2’s trains. When HS2 opens in 2026, it will be 62 years since Japan and 45 years since France inaugurated their high-speed rail services. Despite this late start, it is to be hoped building the UK’s high-speed trains will bring a resurgence in UK train building.